So this is what it has come to: The NFL now has a plan on the table for an 8-game season. If the current labor impasse lingers through the summer, the plan is to start an 8-game season in mid-November with jury-rigged rosters and unprepared players. Woo-hoo! Are you ready for some football? 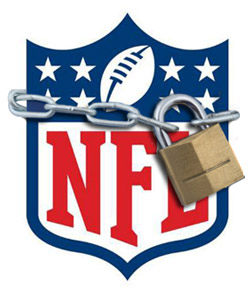 Meanwhile, the NFL owners, who instituted the current lockout in an effort to claw back $1 billion or so in revenues off the top of the now-expired Collective Bargaining Agreement with the players, now find themselves in the comical position of suing the players for dissolving their own union, the NFLPA. Usually, management and unions are dire enemies. Unions, as we know, represent socialism and gulags and the death of the All-American Free-Market Way of Life. Ask all those public school teachers in Wisconsin. Not in the NFL, though. In the NFL, it’s the owners who are the socialists, instituting restrictive salary caps, a player draft, and reserve clauses on younger players. The last thing in the world the owners want to see is a lot of free-market malarkey going on, with players coming out of college and selling their services to the highest bidder in a marketplace unfettered by arbitrary spending caps. Because, you know, Matthew Stafford might not want to play in bombed-out Detroit, and Cam Newton might want to play in state-income-tax-free Dallas or sunny San Diego. Hakeem Nicks, meanwhile, might not want to be calibrating his earnings potential in terms of how much money is left over under the cap after the linebackers get paid. The players’ union, it turns out, is the only thing standing between the owners and the termination of the NFL’s antitrust exemption. If the owners can point to an agreement in good standing with a players’ union, they get to keep their socialism. If the players are all free agents, bargaining individually, the owners don’t get to collude in rigging the marketplace from top to bottom. So why would the owner’s risk their cozy deal? The players, after all, were content to merely keep the terms of the present Collective Bargaining Agreement, an agreement that has coincided with an unprecedented period of prosperity leaguewide, with increases in salary caps indexed to increases in team profits, as reported by the owners themselves. The rest of the owners would just as soon the players take their claims of poverty at face value, however. Hey, building stadiums is expensive, when taxpayers won’t build them for you. There’s only so much TV money, and concessions money, and licensing money to go around. Of course, if the teams were losing money (or were merely only modestly profitable) the owners would be falling all over themselves to open their books. In fact, opening those books would reveal not only that the teams are doing just fine, profitwise, but that they’re also benefiting from profit streams not subject to the Collective Bargaining Agreement. Some people would (and do) argue that the NFL owners are entitled to anything they can get. It’s their league, after all. But if that’s the case, maybe it’s time those same owners tried their luck in a real unfettered free market, red in tooth and claw. Oh, and while we’re on the subject, John Mara, President of the impoverished NY Giants, has some Personal Seat Licenses he’d like to sell you. If “Coaches Club” seating ($20,000 for the PSL, then $700 per game for each actual game ticket) is a little pricy for you, you might consider a seat off in the distant, drafty reaches of Mezzanine B (just $7,500 for the PSL and a mere $400 for each game ticket). Seats are available, but hurry! This entry was posted in Epithets and tagged Cam Newton, Collective Bargaining Agreement, Green Bay Packers, Hakeem Nicks, John Mara, lockout, Matthew Stafford, NFL, NFLPA, NY Giants, Personal Seat License by Harry Ramble. Bookmark the permalink.